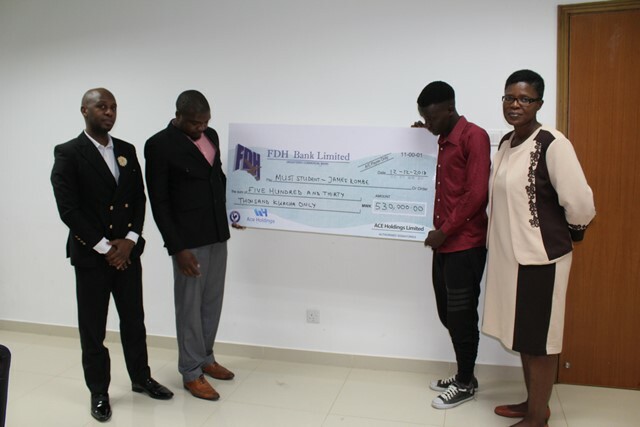 Ace Holdings Limited, a local and small and medium ICT enterprise, has recently paid K530,000 annual tuition and accommodation fees for a student at the Malawi University of Science Technology (MUST). Speaking when he presented a cheque to the student, Ace Holdings Managing Director Macdonald Chisale said plans are underway to set up a foundation that will be offering scholarships for needy students. “We believe in corporate social responsibility because it is one of our core values. We have been helping needy students at University of Malawi. This time we were approached by MUST management to come in and support James Kombe who has been struggling in terms of paying tuition fees. So we feel the foundation will help in supporting needy students because we will be providing scholarships,” he said. Chisale added apart from enabling the students to continue with their education without challenges, the support will also instil in them a spirit of supporting the underprivileged. He then asked Kombe to work hard to attract more support from well-wishers. “It is the results and general good conduct that will sway more well-wishers to support needy students,” he said. Ivy Chinangwa, a lecturer in sports science where Kombe is a student, is the one that approached Ace Holdings Limited for support. She expressed happiness that finally Kombe has been supported. “There are many students who are struggling but for Kombe, he approached me to seek support for him. I cross-checked his situation with his classmates and they confirmed that he was really struggling and I knew that this could affect his performance in class,” said Chinangwa, adding that with the annual tuition and accommodation fees paid, Kombe will now be concentrating on his studies. Kombe was all smiles after the cheque handover. He thanked the organisation for the support and called on other well-wishers to emulate the gesture. He was particularly impressed that although Ace Holdings Limited was relatively small and owned by youthful Malawians, it was willing to support needy students. He promised that he will work hard in class and demonstrate exemplary behaviour now that he is the company’s ambassador on campus.